This is a photograph of Myeshia Johnson. She is the widow of Srg. 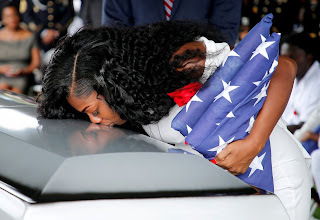 La David Johnson, a war hero who died defending the United States of America. Mrs. Johnson and her family will continue to be in my prayers. The 45th President of the United States of America made an inappropriate and disrespectful phone call to her last week. Instead of apologizing, 45 has made the situation worse. I am embarrassed that Donald J. Trump holds the highest position in our government. He is NOT my president. I don't agree with 99.9% of the nasty things that come out of his mouth and what is posted on his Twitter account.